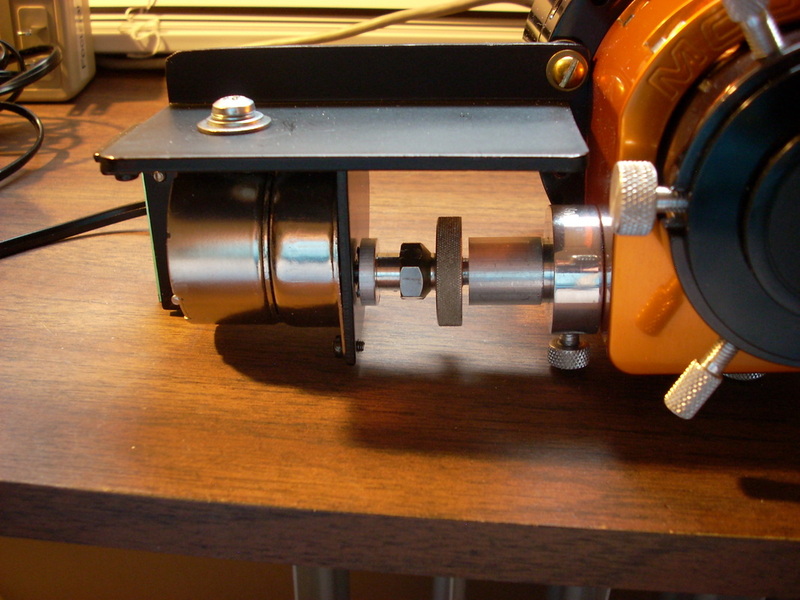 I came across the Arduino Focuser project online and decided it was just what I needed in a do-it-yourself autofocuser. The project can be found at http://ejholmes.github.com/2010/03/28/the-arduino-focuser.html. 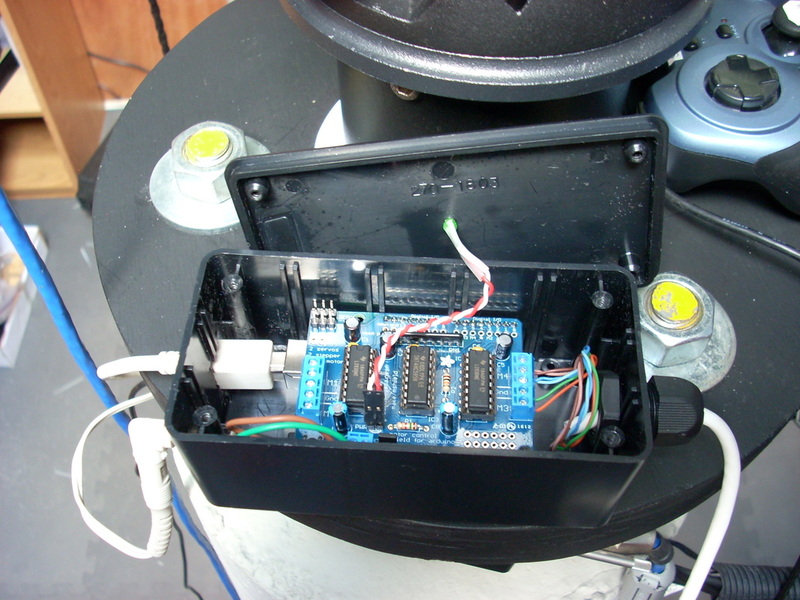 It is an ASCOM compliant focuser and the brain is an Arduino Uno board that controls a motor shield by Adafruit. One issue I ran into worth mentioning deals with downloading the focuser software and compiling it for the Arduino. First, to compile and upload the focuser software into the Arduino, I needed the Arduino software package from the Arduino web site. Here's where the problems started - The latest version of the Arduino software (as of 5/26/2012) is version 1.0, which I downloaded and installed. I then used Firefox to download the Focuser software from EJHolmes' site. To make a long story short I could not get the focuser software to compile and upload into the Arduino. I had multiple compile errors which baffled me until I researched them online. I discovered that I needed to use the previous version of the Arduino software, version 0023, AND I needed to download the focuser software using Internet Explorer and NOT Firefox. I don't know why but downloading the zip file using Firefox seems to have corrupted the files. Once I installed the Arduino Version 0023 software, and downloaded the focuser software using IE, the software compiled and uploaded without error. I also had to download and install the Arduino Focuser ASCOM driver from the ejholmes site. I now have the focuser working in Windows 7 with ASCOM 6.2 and Nebulosity 4. Originally I made an adapter to attach the stepper motor to the Moonlight focuser on my C-11, but now that I'm imaging through the AT6RC I have adapted it to the Astro-Tech focuser. I housed the Arduino and Adafruit motor controller in a Radio Shack project box. I interconnected the motor with the Adafruit board with a CAT-5 cable which plugs into the motor using an RJ11 connector. I mounted a coaxial power connector on the project box and connected it to the external power input of the Adafruit motor controller. I use an external power supply to provide power to the motor and Arduino. The only mod to the Adafruit board was moving the power led to the box lid. 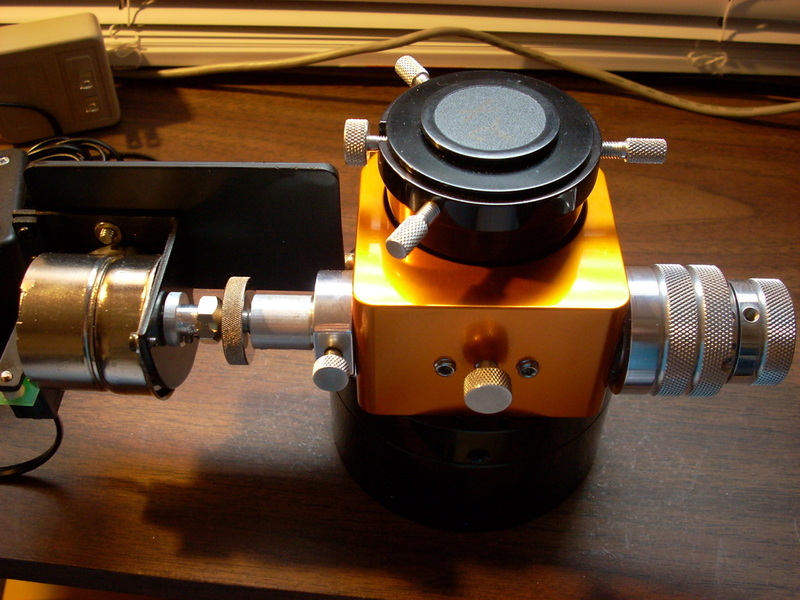 The stepper motor and shaft adapter installed on the Moonlight focuser. The mounting bracket for the motor is cut from a 4" piece of right-angle aluminum stock. It is attached to the Moonlight focuser with one brass screw and there is a rubber washer between the bracket and the focuser. 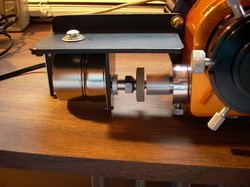 Closeup of the shaft adapter and clutch. 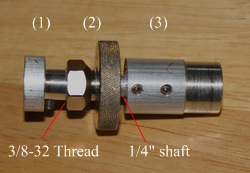 It is basically three pieces: (1) the left side motor adapter, (2) the center shaft lock, and (3) the right side Moonlight adapter. (1) The motor (left) side part of the shaft adapter is .625" aluminum rod with a 5mm center bore and set screw to secure the motor shaft. The right half has been turned down to 3/8" and threaded to 3/8-32. (2) The shaft lock mechanism is the same as used on my C-11 to lock the mirror supports and screws onto the 3/8-32 motor adapter threads. (3) The Moonlight (right) side of the adapter is also .625" diameter and has a 1/4" diameter shaft extending to the left that inserts into the shaft lock mechanism. The right side inserts into the Moonlight and is turned to 15mm in diameter and 10mm wide to match the knob that was removed. 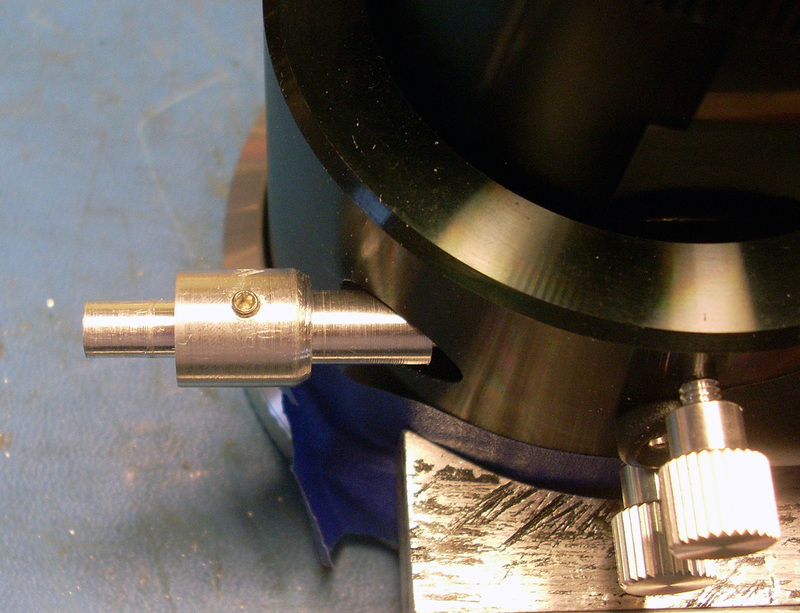 This side also has a 5mm bore to match the focuser shaft and is secured with a set screw. To unlock the motor and manually focus the Moonlight just spin the knob. Tightening the shaft lock mechanism (clockwise) on the 1/4" shaft engages the motor. 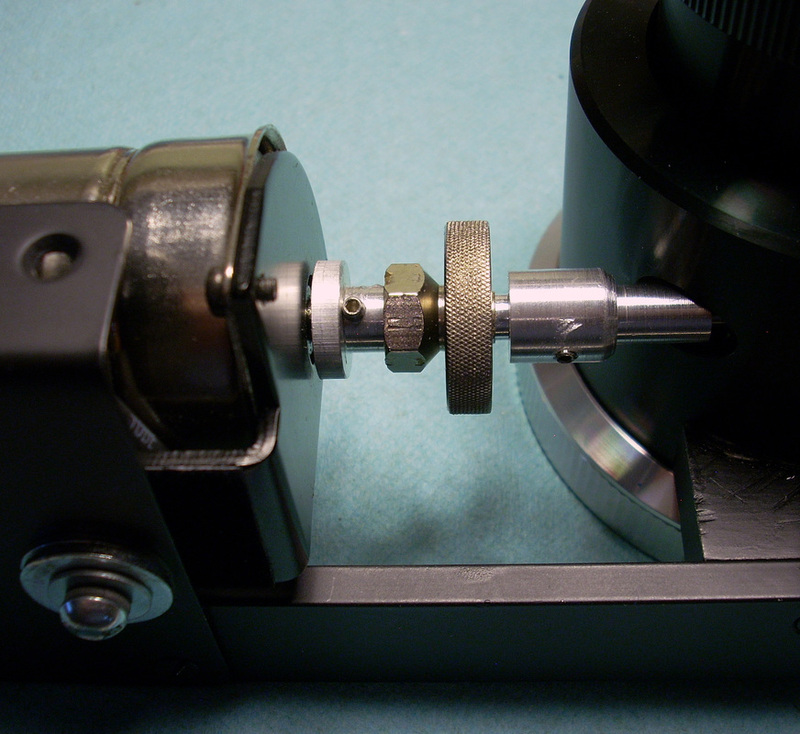 Releasing the shaft lock mechanism (counter-clockwise) allows the 1/4" shaft to rotate freely for manual focusing. The focuser motor mounted to the moonlight. 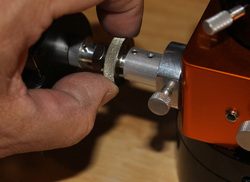 I placed a rubber washer between the mounting bracket and the Moonlight to keep from scratching the focuser's finish. The Moonlight already had a threaded 8x32 hole to attach the bracket. There's a second rubber washer between the motor and mounting bracket on the screw securing the motor. To mount the stepper motor to the Astro-Tech Crayford I made a radius block that attaches to the bottom of the focuser using two existing screw holes. To this I attached a cross bar with a plate to hold the motor. 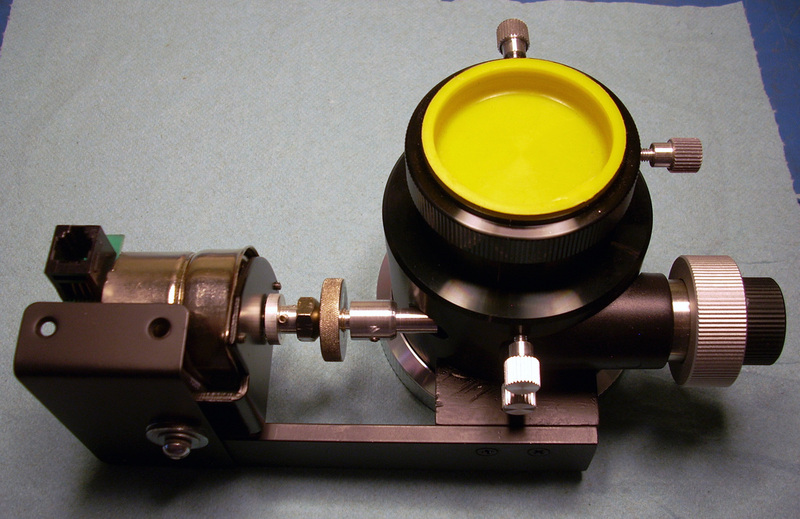 I made a new focuser-side shaft adapter to mate the Astro-Tech focuser shaft with the existing motor adapter from the moonlight setup. The new shaft adapter for the Astro-Tech replaces the adapter for the moonlight shaft. The other adapter parts are common to the Moonlight adapter.